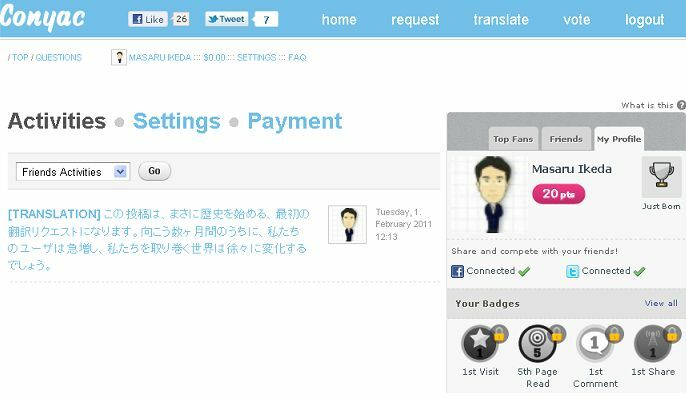 Tokyo-based tech start-up Anydoor announced today that it had completed the integration of its social translation service Conyac with Facebook and social rewards platform Badgeville, which allows potential users to join the service more easily and to motivate participating users to be engaged. Conyac enables you to request a translation easily. Users can ask for translations in exchange for a small amount of money and other users around the world can then translate the requests, receiving rewards in return. Integrating Facebook enables any of Facebook users to become a Coynac user (translation requester or translator) without entering a bunch of user information, and integrating Badgeville enables them to earn rewards when finishing someone’s translation request or evaluating someone’s translation result. Conyac has some 5,000 users. The company’s co-founder Naoki Yamada expects this integration will highly contribute to accelerating the growth of the users. It aims for having 10,000 users in a month, and 200,000 users by the end of 2011. The newly integrated version is currently running on beta, and it will be released officially in March. That’s cool. I wonder how quality is managed with all these “members”? Anyone know? I heard Facebook has had some issues inthe past with member translations. They have scoring system to evaluate translated results by the other users. Furthermore, translation requesters can choose the best one from multiple results posted by the other users, which decides which you will pay to. Those features work very efficiently to keep their quality high.